320 pages | 8 B/W Illus. Until a century ago, a metaphor was just a mere figure of speech, but since the development of discourse analysis a metaphor has become more than merely incidental to the content of the arguments or findings. Students and scholars in political studies know the importance of metaphors in electoral and policy-related politics, coming across metaphors that are, knowingly or unknowingly, influencing our perception of politics. 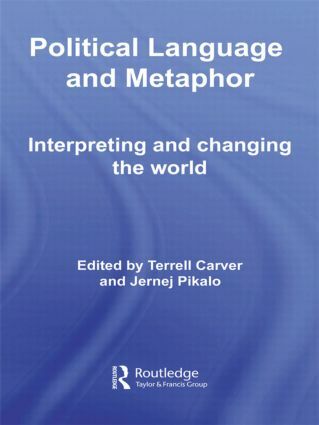 Advances research that investigates the role of metaphor in empirical and discourse-based methodologies, thus building on results from other disciplines, notably linguistics and hermeneutic philosophy. This innovative study will be of interest to students and researchers of politics, international relations and communication studies. Terrell Carver is Professor of Political Theory at the University of Bristol, UK. Jernej Pikalo is Lecturer in Political Theory at the Faculty of Social Sciences, University of Ljubljana, Slovenia.